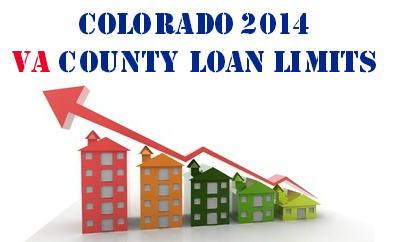 For all Colorado counties other than those listed below, the limit is $417,000. VA Jumbo will allow you to lend over the above limits, but you will be responsible for paying 25% of the difference between the loan limit and the purchase price. The Department of Veterans Affairs (VA) Loan Guaranty program does not set a maximum amount that an eligible Veteran may borrow using a VA-guaranteed loan. Lenders may make loans to Veterans over the calculated maximum loan limit; however, lenders may require Veterans to make a down payment in these types of transactions. The following loan limits must be used to calculate VA’s maximum guaranty amount. These limits apply to all loans closed February 28, 2014, through December 31, 2014. VA loan limits are based off median home values estimated by the Federal Housing Administration (FHA). These values are the basis for which VA calculates limits for our program. For 2014, some limits increased, some stayed the same, and a few decreased. The maximum guaranty amount (available for loans over $144,000) is 25 percent of the 2014 VA loan limit shown below. Therefore, a Veteran with full entitlement available may borrow up to the 2014 VA loan limit shown below and VA will guarantee 25 percent of the loan amount. Lenders should check their own investor requirements regarding guaranty amounts and down payments. Questions about VA loans in a particular may be directed to the VA Regional Loan Center of jurisdiction.